The Littlefield Group has lots of fun stuff going on right now! 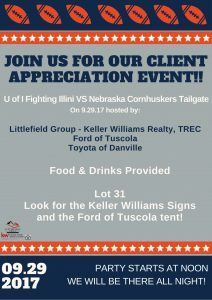 This Friday (29 SEP) we’re hosting a client appreciation party tailgate for the Illinois vs. Nebraska game! We’re co-hosting this event with Ford of Tuscola and Toyota of Danville in Lot 31 on the West side of Memorial Stadium just West of 1st St. Come by and get some food and have a drink with us while we show our appreciation for you being a client of ours. Our clients mean the World to us so we would like to do something for you! 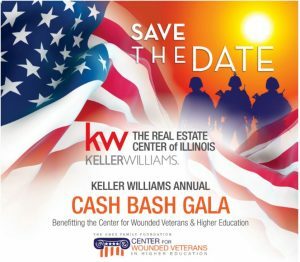 Also, we’re helping with the Annual Keller Williams Cash Bash Gala to support the University of Illinois’ Chez Center for Wounded Veterans in Higher Education. We’re trying to raise over $150,000 for this cause! Tickets are now on sale at KWCashbash.com. The invites are below for both of them and we hope to see you there!